Church Street Concept – Green Space Alliance | Urban designers | Planners | Landscape Architects. While working at planningAllinnce, GSA principal Dnyanesh Deshpande assisted the City of Edmonton’s Urban Design Group in preparing a comprehensive urban design concept for the 96 Street corridor also known as the Church Street corridor due to the high concentration of church organizations along 96th Street. 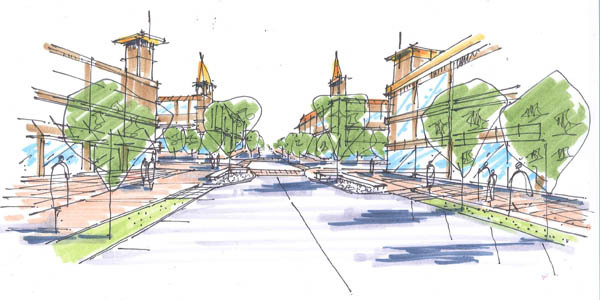 The urban design concept included streetscape design, detailed design of key streetscape elements and conceptual three dimensional illustration of the proposed development. A series of additional illustrations were also developed for three new direct control districts for various character areas along the 96 Street corridor. 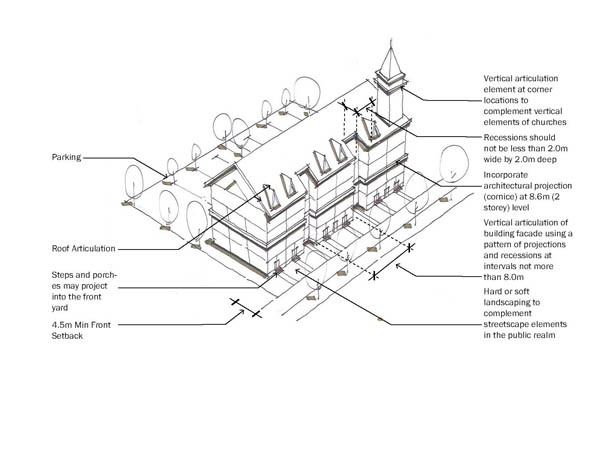 The urban design concept focused on establishing common architectural language, establishing development setbacks, proposing new entrance features and undertaking significant public realm improvements for the area while respecting and enhancing the heritage character.